I hit a new low weight this morning, and I’m finally heading below 80 kg, towards my final weight of 70 – 75 kg. Losing these last 5-10 kg will be fun. I’m eating the way I want to, unafraid of any of the popular diet superstitions (e.g., “carbs make you fat”, or “fat makes you fat”), and watching my weight ease down to where it belongs. I picked up 500g of fresh spaghetti from Assenti’s on my way back from spin class. 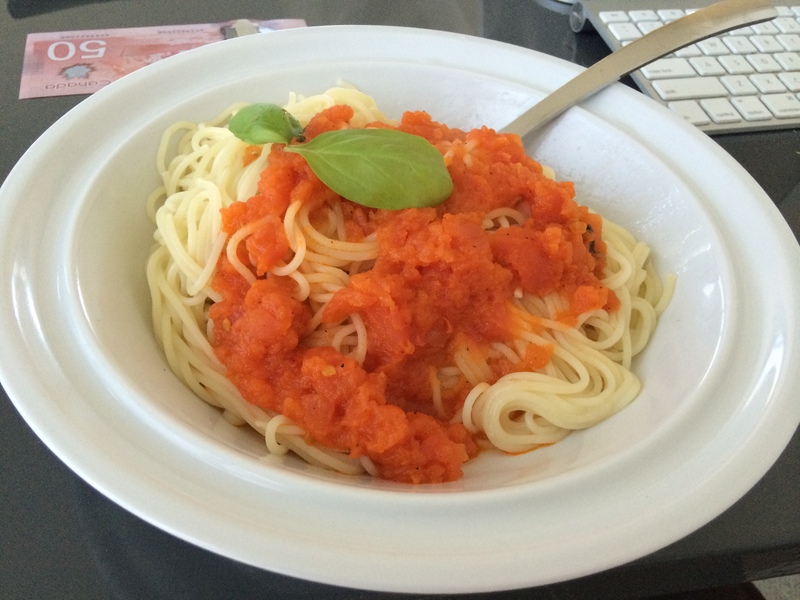 I made traditional Spaghetti al Pomodoro, using some olive oil, garlic, and fresh basil. I ate 250g of the spaghetti, but I’m still hungry. I’ll probably pick up another 3 lbs of corn tortillas from Gabriel’s. Or maybe I’ll get a veggie burrito from Taco Rey on 4th. Or maybe I’ll just eat the other 250g of spaghetti. I’m not sure. All I know, is I’m still really hungry.